Solutions for eight of the toughest grooming problems. Consistent daily grooming keeps your horse looking good and makes the job easier. Whether you’re getting ready for a show or are short on time to tack up and ride, regular maintenance helps ensure you won’t have to do an extreme makeover at the last minute. 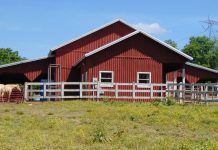 That’s not to say your horse won’t go roll in the mud right before you arrive at the barn to ride him, or that your white horse won’t be green on show day—these things are almost guaranteed to happen. Here are some grooming dilemmas you are likely to encounter, and tips to clean them up. Horses are magnets for mud. They love to wallow and roll in it. The easiest way to manage mud is to hose it off. However, that’s not always possible. If it’s too cold to give your horse a rinse or you don’t have access to water, you have a few options. The first strategy is to let it dry and then brush off as much as you can. If your horse will tolerate it, you can gently scrape the biggest chunks off his body with a metal curry or shedding blade. For more sensitive types, stick to a pebbled rubber grooming mitt or rubber curry. The grooming mitt works well on the legs and head. Follow up with a stiff or medium brush. This process will be time-consuming and requires plenty of elbow grease. Never brush wet mud; this will only grind it deeper into the coat. Another option is to use a damp towel to remove as much of the mud as possible. (See “Cold Weather Bathing” below.) However, the best offense is a good defense. Prevent a winter mudfest by dressing your horse in a blanket that’s an appropriate weight for the weather. And adding coat polish spray to your grooming routine will help repel stains and keep mud from sticking to your horse’s coat. Be sure not to spray the slippery stuff in the saddle area, though. If your horse objects to bathing, here are some tips to make the situation more tolerable for him and safer for you both. 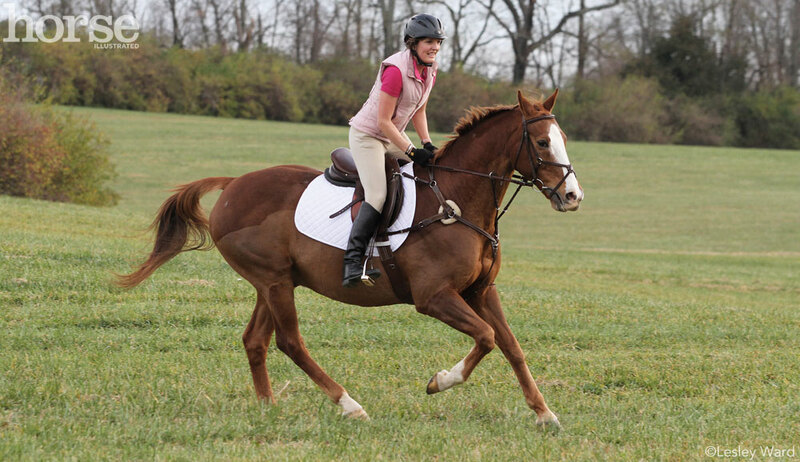 First, make sure your bathing area has non-slip footing so that your horse won’t fall if he starts to scramble. Keep the wash rack clear of buckets, shampoo bottles or anything he might step on or bump into, which can also intensify his fears. You want the experience to be as pleasant as possible for your horse. An adjustable nozzle with gentle spray settings can make the process more comfortable, and warm water is a plus if your barn has it. (Warm water is also more effective for cleaning.) While you’re working on your horse’s bath-time manners, you might find it helpful to have a friend hold him instead of tying him. If your horse has never been exposed to a hose or wash rack, allow plenty of time to introduce the bathing process one step at a time. Don’t wait until the morning of a show or another high-pressure situation for your horse’s first bath and expect the job to go smoothly. Start low and slow with the water. Direct the spray at your horse’s lower front feet and wait until he’s comfortable with that before progressing up his legs to the shoulder and body. Bring your patience! You may have to start with just one hoof in the water, if that’s what it takes. If your horse is very skittish, start with a sponge and bucket to get him used to water before introducing the hose. Use plain water until your horse is ready to handle a full bath with suds. You don’t want to get stuck with a soapy horse that won’t let you get near him with the hose. And most horses, even those who are old pros with the bathing process, don’t appreciate a hose blasting their face either. Use a cloth or sponge to clean your horse’s head. When it’s too cold to bathe your horse, you can still accomplish quite a bit of cleaning with a bucket of water and a few towels. Dunk a towel in the water and wring it out thoroughly. You may want to wear rubber gloves to keep your hands comfortable. Working in small sections, towel your horse vigorously, going back and forth against the hair growth to lift dirt. If it’s very cold out, cover your horse with the cooler and just expose the part of the horse you are working on. Follow with a dry towel in the same manner to remove excess moisture. Don’t be afraid to go against the direction of hair growth; this will allow you to get a deeper clean. Leaving the hair fluffed up helps to speed the drying process. Change the water as needed, and replace your towel if it gets too dirty. Wash your horse’s legs with the hose unless temperatures are too frigid. To finish, spritz with a conditioning coat polish spray (skipping the saddle area) to give your horse’s coat an extra touch of shine and to help repel dirt and mud. Cover him with the cooler to keep him from getting chilled and to wick moisture from the coat. Whitening shampoos typically have a blue or purple tint to counteract yellow staining. To get the best results, be prepared to put in some effort. Scrubbing for that deep clean will give you the whitest white. Use a rubber curry, bath mitt or your fingers to work the suds into the coat and clean down to the skin. Warm water also cleans more effectively than cold water. Adjust your spray nozzle to the max pressure your horse will tolerate to remove any lingering dirt from your horse’s coat. A deeply stained tail is one of the toughest grooming challenges, and may require several shampoos with a good whitening formula to show improvement. With a white horse, it’s crucial to keep up with regular grooming so that stains don’t set in. For quick cleaning, use one of the waterless spot-treatment products. These can be sprayed directly on the stain or applied with a sponge or towel. Scrub against the hair to lift the stain. Burrs entangled in your horse’s mane, tail and forelock can be a challenge to unsnarl. Staying on top of burr removal is essential to keep the problem from getting out of hand. Once burrs become deeply embedded, it can be nearly impossible to remove them without cutting or pulling out hair. Apply a coat polish spray or detangling serum directly to the burr, then work on removing it from the slicked strands, wearing gloves to protect your hands if necessary. Apply coat polish spray regularly to help keep burrs from sticking in your horse’s hair. Mane pulling is a task that requires constant upkeep to maintain the desired shortness and thinness. Some horses aren’t big fans of the process, which involves pulling out the hairs by hand. (See “Mane-Pulling Method,” below.) To make it more tolerable, try pulling fewer hairs at a time, and do a little bit every day instead of one big session, which will try your horse’s patience. Also wait until after a workout to pull, when your is warmed up and the hair comes out more easily. You may be tempted to grab the scissors and hack it off, but this will leave it looking unnaturally blunt. If the mane is overgrown, you can cut it down to a more manageable size using thinning shears, a mane knife or clippers turned vertically so that you get somewhat of a natural-looking irregular edge. Try to make your cuts from the underside of the mane. You may still need to finish the job by pulling, but this will make the task less overwhelming. If your horse has a sparse mane that needs shortening without losing volume, use a mane knife to razor it off to the desired length. Or, use scissors held vertically, going the same direction as the mane, and snip the ends. If your horse objects to mane pulling, try using a mane knife or trimming device such as the Solo Comb (shown) to razor off length. Grab a small section of hair in one hand and hold it firmly at the bottom. Keep holding those hairs, and with a small metal pulling comb in your other hand, backcomb the hair up toward the roots. Wrap the hairs remaining in your fingers around the comb for leverage, and give a quick tug to remove them. Continue the process along the neck until the mane reaches the desired length and thickness. Tail rubbing is one of the most frustrating grooming problems horse owners have to contend with. It’s disheartening to see a bald spot rubbed out at the top of your horse’s tail, surrounded by a frizz of broken hairs. Some horses will even rub themselves raw. But tail rubbing is more than just a bad hair day. Often, the cause is health related. Common causes of tail rubbing include dry, itchy skin; parasite infestation (pinworms); or an allergic reaction caused by hypersensitivity to certain types of flies or gnats. Start by stepping up your fly-control measures. If you suspect parasites are the cause, check with your vet to make sure your horse’s deworming program is on the right track, and deworm your horse with the appropriate product. A dirty sheath or udder can also result in tail rubbing. Since horses can’t itch these places, they’ll often turn to tail rubbing for relief. Schedule a sheath cleaning and see if that improves the situation. Also try cleaning under the dock of the tail with a baby wipe as part of your regular grooming routine. For topical treatment, a soothing, moisturizing shampoo may alleviate the itchies, or some people find that an antifungal shampoo is beneficial. Scrub all the way down to the tail bone and be sure to rinse well, since leftover shampoo residue can be drying and irritating. You can try one of the many healing creams you’ll find at the tack store too: these typically contain ingredients with soothing, moisturizing or antiseptic properties, such as aloe, lanolin or tea tree oil. Many horse people swear by treatment with original antiseptic Listerine mouthwash for a popular home remedy; you can mix it with baby oil to add in moisture. However, do not apply Listerine on raw or broken skin, as the alcohol will burn. If the tail rubbing is severe enough to cause abrasion or open wounds, you may be dealing with an infection that will need to be addressed. There are various types of allergies that can cause tail rubbing too. For persistent or severe cases, contact your vet for diagnosis and treatment. Less is often more when it comes to tail care. Preserve precious strands to get a long, luxurious tail. While tail thickness may be genetically determined, regular maintenance will keep your horse’s tail looking its best and prevent tangles from taking over. Regular detangling keeps big knots from forming and makes the hair easier to manage. If you want your horse to have a glorious mane or tail, your goal is always to minimize breakage. Avoid excessive brushing, and be gentle when handling your horse’s tail hair. The gentlest way to detangle is by hand. A mane-and-tail detangling serum can make the job easier so that the strands of hair slip apart without breaking. Coat polish spray and shine products also do double-duty for detangling. Apply the product evenly throughout the hair. Start detangling from the bottom, working your way up in small, manageable sections. Once you can easily run your fingers through the hair, follow up with a brush or comb if you wish. The right tools and technique are essential. Use a flat-backed brush with widely spaced, soft-tipped bristles or a wide-tooth comb to minimize damage. Hold the hair in one hand and brush below in order to avoid pulling on the root—again, working from the bottom up. Even if you opt for a more minimalist approach to grooming your horse’s tail, at least remove debris such as shavings and hay from the hair. There are also measures you can take to keep your horse’s tail clean and tangle-free with less daily upkeep. Many people opt to braid the tail and cover it with a protective tail bag. This requires less daily maintenance, although you will need to periodically rebraid the tail. Shampoo and condition the tail and allow it to dry completely before you braid it. Always braid and bag below the tail bone; never attach a tail bag or anything else around the tail bone, where it could cut off circulation. Tail bags should also be monitored closely. Also remember that your horse’s tail serves as a fly swatter. If he lives out in a field or the flies are particularly vicious, braiding and bagging takes away his protection against the pesky insects. 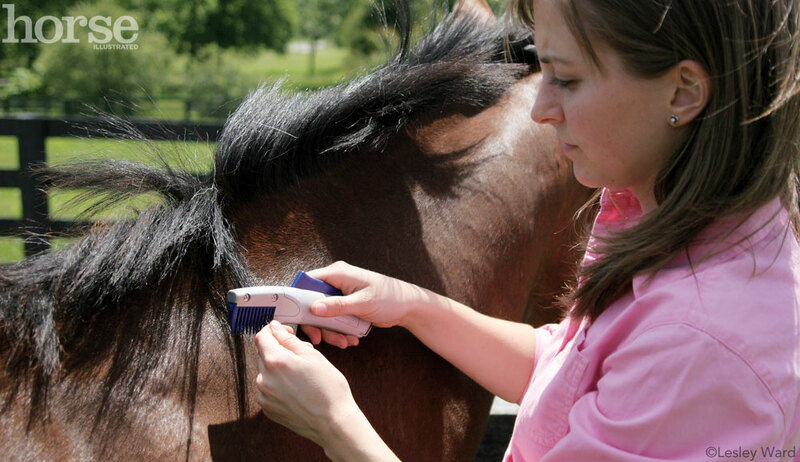 A trace clip removes hair only where horses tend to sweat the most. Your horse has sprouted the coat of a yak. How do you deal? If your horse works up a sweat, it’s important to make sure he is cooled out and dried off before putting him away. When his winter coat is soaked, it loses its insulating properties, and your horse could become chilled. For equestrians with an active winter riding schedule, or those in warm climates such as California and Florida, body clipping is the answer. Using large, powerful clippers to zip off the winter coat will allow your horse to sweat less, dry quickly and be more comfortable when exercising. However, if you opt to body clip, you’ll need to commit to keeping him blanketed appropriately for the weather. This is a daily chore that can’t be neglected. A full-body clip is best for horses that are stabled full or part time. If you live in a cold-weather climate and want to leave your horse with more natural protection during turnout, you might opt for a partial clip instead, although you’ll still have to blanket. A trace clip removes hair only from the underside of the neck, chest, belly and flanks where horses tend to sweat the most. The legs, back and topline still sport a full haircoat. The more minimal strip clip removes hair from the underside of the neck and part of the chest. Body clipping takes some practice to master. It’s best to learn from an experienced clipper, but it’s really not hard to do. The key is good preparation with a clean horse, clippers that are heavy-duty enough for the task, and freshly sharpened blades, along with a spare set. There’s no reason to clip if you ride only occasionally in the winter. But if your horse manages to work up a sweat, you need to cool him out and dry him off so that he doesn’t become chilled. Here’s one way to do the job: You’ll need several old bath towels and a cooler or sheet in a moisture-wicking material, such as fleece or wool. It helps to have an extra cooler on hand if the first one becomes soggy. After you untack, cover your horse with the cooler. Pull back the cooler to access one area at a time and give your horse a vigorous rubdown with your towel to remove as much moisture from the coat as possible. Rub against the direction of hair growth to fluff the hair up so it can dry. Change towels if the one you are using gets too wet. In addition to keeping your horse warm, the cooler will also help wick moisture from the coat. Your horse should be dry before you put his blanket back on. This article originally appeared in the 2015 issue of Your New Horse. Best way to get rid of burrs is to crush them. Part of the reason they’re so hard to get out is that they’re round with projections spiking out and snarling into the hair strands, but if it’s crushed then they’re just spikey things that can be brushed out once the snarls are tamed.